The cult of St. Thomas originated in and was centred at Edessa at least up to the eighth century when the Muslims began to invade Syria, and it is the considered opinion of many historians today that nobody in Asia was interested in this “second Jesus” — Judas Thomas was a look-alike twin brother of Jesus according to some authorities — except Edessa from where his cult radiated outwards. Syrian Christian merchants carried it westward to Ethiopia, eastward to India, and northward to the bazaars of Constantinople. This view was anticipated by the “St. Thomas” Christian Dr. G. Milne Rae of the Madras Christian College at the end of the 19th century. Bishop Medleycott is the godfather of Thomas-in-India scholarship in India, and even in his day he was accused of working under religious, racial, regional, political, and linguistic influences. He was the Vicar Apostolic of Trichur from 1887 to 1896, the diocese in which the alleged landing-place of St. Thomas, Kodungallur, is located, and was the first European missionary bishop to be appointed by Rome to rule over the local Syrian Christian community. This community existed in a forgotten Kerala backwater that was overshadowed by San Thome at Mylapore, and Bishop Medleycott had a mandate – or believed he had a mandate – to raise Kodungallur’s status and prepare the ideological ground for the apostle’s “return”. Medleycott soon discovered that this was not very hard to do. The old tradition of St. Thomas was still alive in Malabar, in medieval Syrian wedding songs and “evidence” left behind by those pious forgers and pirates, the Portuguese, and he had local Syrian priests to advise him. There was also the Acts of Thomas, which nobody knew in the original and which no Christian priest would dare to teach to his congregation. All that was needed was inventive Catholic scholarship to turn a local Kerala Christian tradition into world history. Bishop Medleycott won the day with his work, though he didn’t live to see it. 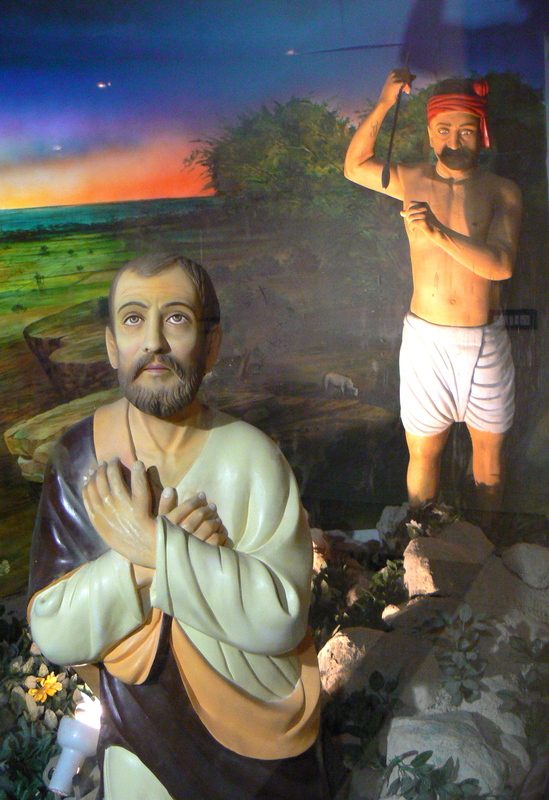 St. Thomas was “returned” to Kodungallur in 1953, in the form of a piece of bone from the elbow of his right arm. The relic was a gift from the clergy of Ortona, Italy, where the apostle’s Church-authenticated remains had lain since 1258. They had been brought to Ortona from Edessa by way of Chios in Greece, and, according to one tradition that is repeated today as factual if unverified, had arrived in Edessa from “India” between 222 and 235 CE. In the Acts of Thomas the bones were transferred to Mesopotamia from “India” – the “desert country” of King Mazdai – in the lifetime of the Persian king. Eugene Cardinal Tisserant, the other imaginative writer of oriental church history, led the “second coming” to Kodungallur 1953, and he later proceeded to Mylapore with another bit of Ortona bone for the cathedral there. For the first time in history both sites in India associated with St. Thomas in legend and story could truly say that they possessed the apostle’s relics. This event and the alleged first century coming of the apostle were commemorated by the Government of India with postage stamps that were issued in 1964 and 1973. The first stamp depicts the silver bust of St. Thomas that is in the cathedral at Ortona, which contains his complete skull, and the second shows the eighth century Persian “St. Thomas” cross on St. Thomas Mount near Madras. That neither these artifacts nor the relics, or, for that matter, the legendary event that they celebrate, are Indian, is one of the ironies that is part of the history of the story of St. Thomas in India. But Bishop Medleycott’s victory went further. He got himself named as the St. Thomas authority in the prestigious Encyclopaedia Britannica, Fifteenth Edition, 1984, along with Chevalier F.A. D’Cruz, editor of the old Mylapore Catholic Register and author of St. Thomas the Apostle in India. The Acts does not “cite” this at all of course; it does not even remotely suggest it. There is no known record that Mylapore had a king in the first century and if it did, he was not a Zoroastrian with the name of Mazdai. What the Christian propagandist is doing here, is conflating Mylapore Shiva’s title Mahadeva — which he wrongly identifies as the name of a supposed first century human king of Mylapore — with the name of the Persian king, Mazdai, who executed Thomas for crimes against women in the Acts of Thomas. This is a very crude concoction and it is astonishing that the editors of the Encycopaedia Britannica (and Wikipedia as we will see) have fallen for the verbal subterfuge. Now even if some of the Acts is accepted as probable, the composer of this entry still hasn’t got the story right. He uses the word “allegedly” for the visit of St. Thomas to the court of Gondophernes — assuming that Gondophernes is the same as Gundaphorus — when he could correctly cite the Acts for the reference. These errors are deliberate and motivated, given their context and arrangement, and this St. Thomas entry in the Encyclopaedia has been written by a Catholic scholar who not only subscribes to the apostle’s alleged South Indian adventure, but wishes to place the Mylapore tale over that of the Malabar tradition. He does this by mixing the North Indian legend, represented by the Acts, with the South Indian fable that the Portuguese left in Mylapore, to promote his particular South Indian masala view. He gets away with the deception because nobody has read the Acts of Thomas and studied its references to the kings Gundaphorus and Mazdai (in Persian, Misdaeus in Greek, Misdeos in Latin), and the execution of Judas Thomas on a mountain that contained an ancient royal tomb. We did not pay any more attention to the matter until February 2010 when we began updating The Myth of Saint Thomas and the Mylapore Shiva Temple and had a look at the St. Thomas entry on the Encyclopaedia Britannica website. It begins like this, “Saint Thomas (born, probably Galilee, died AD 53, Madras, India …)” and continues, “Later Christian tradition says Thomas extended his apostolate into India, where he is recognized as the founder of the Church of the Syrian Malabar Christians, or Christians of St. Thomas. In the apocryphal Acts of Thomas, originally composed in Syriac, his martyrdom is cited under the king of Mylapore at Madras, where are to be found St. Thomas Mount and San Thomé Cathedral, his traditional burial-place….” It is virtually the same article as in the 1984 Fifteenth Edition, with the same absurd claim that the Acts of Thomas cites the king of Mylapore as his executioner. None of these entries are correct but the reference to Kottayam and Madras, giving the specific date of 53 CE for St. Thomas, is just a reworking of the Encyclopaedia’s 1984 entry. The various dates for St. Thomas’s arrival in India and death in Madras are inventions that were added to the legend in the nineteenth century. The editor has not kept his promise and has maintained the same information about St. Thomas and India in different wording. The charge that the Encyclopaedia Britannica is a Catholic encyclopaedia intent on promoting a traditional Christian point of view remains. It has always been that way with the Encyclopaedia: Joseph McCabe the great linguist and historian of early Christianity, could not get it to correct and change its wrong entries for early Christian history either. Bishop Medleycott with his papal mandate and imperial urges, totally discredited as a historian of Christianity in India, remains the last word on St. Thomas in India in all Catholic encyclopaedias and, believe it or not, the Internet’s modern, up-to-date Wikipedia as well. The editors of this article will have to consider the fact that all references to Thomas in Indian Christian tradition and folklore have been rejected as unhistorical by responsible Christian scholars and ecclesiastics (barring a few like Medleycott and Arulappa) for the past two centuries. The elaborate and confusing mythology of Thomas is not factual or verifiable and cannot ethically be represented as true history in an encyclopaedia. These pious legends may have a role to play in religion but they do not have a place in Indian history writing unless they are identified and qualified for the general reader. The reputed Christian historian A. Mingana has written in The Early Spread of Christianity in India that “What India gives us about Christianity in its midst is indeed nothing but pure fables”. This is true about the Thomas tradition in India and in the numerous other places it exists in Asia except perhaps Edessa where it originated. Any serious article about Thomas in India, or the various controversial and disputed places of pilgrimage associated with him, should be unambiguously declared as faith-based and historically unverified. To do otherwise in an encyclopaedia article is intellectually dishonest and misleading and amounts to little more than religious propaganda created in the interests of a certain theological point of view. This single attributed reference to a Hindu scholar was too much for the Kerala Christian Wikipedia page administrator Tinucherian (Cherian Tinu Abraham). Within an hour of the post, he deleted our reference to Swami Tapasyananda and rolled back the other postings we had made that day. It was a real surprise to us. Where we had made an effort not to interfere with earlier postings, we discovered that the same courtesy was not extended to us and that we would not be informed when we had “offended” Tinucherian’s Christian enterprise. 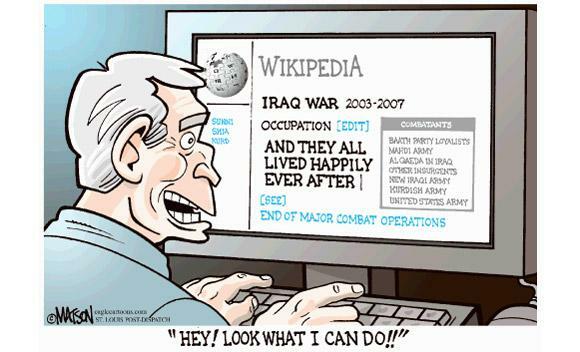 We abandoned Wikipedia as a waste of time and effort and our contributions were soon perverted or deleted altogether. The concocted absurdities found in the Wikipedia Thomas the Apostle article today, which lacks citations and references that stand up to scrutiny, can be exposed with a single example: the statement in the Thomas and India subsection of the article says that the king who executed Judas Thomas for sorcery and crimes against women, Mazdai (Misdaeus in Greek), was “the local king at Mylapore”. This is a preposterous statement. The name Mazdai (or Masdai) is Persian and specifically identifies a person who is Zoroastrian by religion. Mazdaism identifies a worshiper of Ahura Mazda and is a synonym for Zoroastrianism. 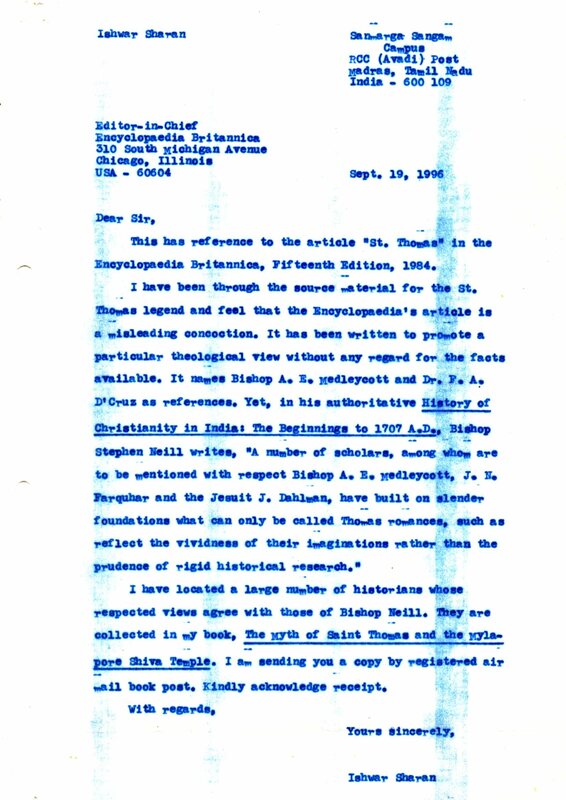 Associating the Acts of Thomas and its Persian king Mazdai with Mylapore is motivated Christian scholarship – something Dr. M. Deivanayagam of the Madras-Mylapore Archdiocese would produce – and the fact that the Wikipedia administrator Tinucherian allows such unsupported statements to stand unchallenged shows that he is deeply involved in the crime of writing a deliberately false and perverted history of Christianity in Mylapore. Wikipedia with its free-for-all constitution and arbitrary, secretive contribution and editorial oversight system lacks all credibility. Every fact checked with this Internet reference has to be checked some place else if it is to be accepted as authoritative. Many of its articles on Christianity in India are propaganda projects set up to project a particular Christian world view. This is to be expected: the wiki editing system invites India’s cultural enemies, Christian missionaries and other western neo-colonialists, to propound their hostile, anti-Indian theories. Its administrators are not authorities on the subjects they oversee (Tinucherian is a Bangalore software engineer who knows nothing about St. Thomas and the history of Christianity in India except for what his pious mother may have told him) and their personal prejudices soon become evident and interfere with factual and cited contributions. Wikipedia is the perfect platform for Christian propaganda in India and is being used for that purpose with great effect in its Christianity in India project. This Wikipedia series even employs the symbol of a cross superimposed on a light blue map of India, a symbol that is highly offensive to the majority Hindu population who identify India as their mother and civilizational homeland. The fabulous and false “facts” about St. Thomas and India found in the Encyclopaedia Britannica and its Internet sister Wikipedia make the ancient Greek historian and geographer Strabo into a prophet (he was a contemporary of Jesus and Thomas). He said, “Generally speaking the men who have written on India were a set of liars.” And so it is with the contributors to the mainstream encyclopaedias and dictionaries that reference Indian history today. Falsely accusing the native Hindu population of an ancient India that gave 4th century Syrian Christian refugees from Persia funds and land to build churches, with the murder of their patron saint Mar Thoma, is a blood libel and falls into the category of “intemperate vomit of false witness, hatred, and uncharitableness”. Christians are perceived to be an educated and modern secular community, but we see from their fabricated encyclopaedic writings on St. Thomas (many of which have appeared after the publication of our 1991 essay) that they are the most superstitious of Indian communities with an obsessive allegiance to an authoritarian and very corrupt medieval Indian church. But it is not only international English-language reference works that repeat the falsehood that St. Thomas came to South India and was murdered in Madras by hostile Hindus. Indian reference books repeat the St. Thomas tale because they are too lazy to do any original research of their own and simply copy existing sources which are usually Christian or western sources. For example, the Christian Internet reference Indianetzone in its long self-persuading entry for St. Thomas treats him as Kerala’s first Christian missionary. They wax eloquent about the old St. Thomas traditions in Kerala and how everybody believes them so they must be true. Fine for the Christian faithful, but this is story telling not India history writing. A lie does not become truth with old age and much repetition by Christian priests! 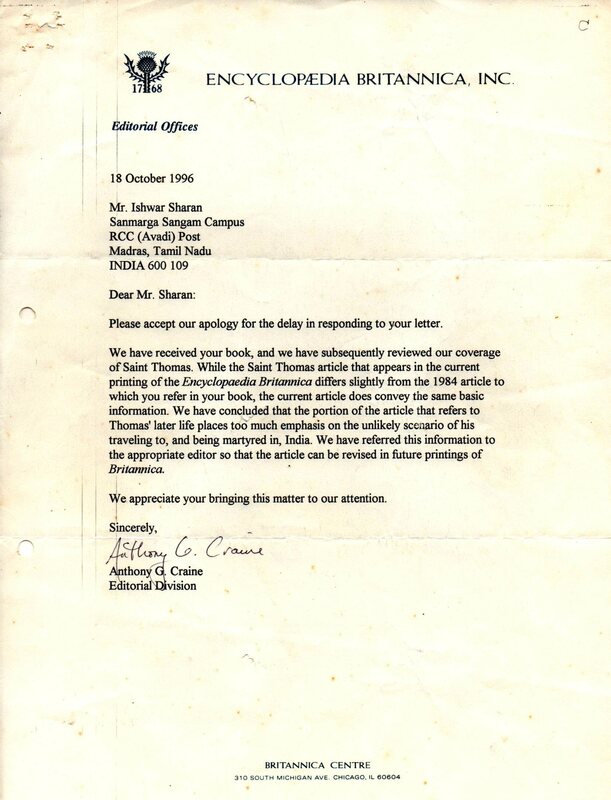 We have twice contacted the editors and given them the known historical data on St. Thomas, but to no effect. They block our comments, delete our registration from their site, and refuse to acknowledge our mail. Like the Encyclopaedia Britannica and Wikipedia, Indianetzone is deeply attached to its fictitious and fabulous St. Thomas entry and will not let it go for a more prosaic and truthful account of Christianity’s origins in India. If St. Thomas lived at all — and we have no positive evidence for this either — it was in Palestine and Syria, and it was in Syria and Persia, or Parthia, that he proselytised the inhabitants and established churches. This is what the most ancient Alexandrian tradition maintains and what the seventh and eighth century Metropolitans of Fars, Mar Isho Yahb and Mar Thiomothy, testify to when they refuse to submit to the Patriarch of the East at Seleucia-Ctesiphon because their Persian church had been established by Thomas while his had not. The Edessene tradition is a case of Edessa glorifying an apostle they considered their own — Thomas had visited their city and they possessed his bones — at the expense of India — if of course the “India” of the Acts doesn’t simply mean Persia. G. Ananthakrishnan in the Times of India, Mumbai, 26 Dec. 2006, reports: “Pope Benedict XVI made the statement [about St. Thomas] at the Vatican on September 27, . Addressing the faithful during the Wednesday catechises, he recalled that St. Thomas first evangelised Syria and Persia, and went on to western India from where Christianity reached Southern India. The import of the statement was that St. Thomas never travelled to south India, but rather evangelised the western front, mostly comprising today’s Pakistan.” Though the Pope is a declared enemy of Hindu India, he is a scholar and had reported the known facts about St. Thomas and his missionary journey to Syria and Parthia. He had said, ” … Thomas first evangelised Syria and Persia and then penetrated as far as western India, from where Christianity reached also South India” (It is another matter that his editors on the Vatican website changed this sentence the next day to read that Thomas himself had reached South India). The churches that are traditionally said to have been established by apostles were known by the names of the cities or countries that they were established in. The famous four were the Churches of Alexandria by Mark, Jerusalem by James, Antioch by Peter and Paul, and Rome by Peter. The Church of Edessa was said to have been established by Addai the disciple of Thomas and the Church of Fars by Thomas himself. But there was no Church of Muziris (as Kodungallur was known to the Greeks and Romans) or Shingly (as it was known to the Jews) or Malabar or India in the first centuries CE. The Church of Seleucia was said to have been established by Aggaeus the disciple of Addai of Edessa in the second century CE. This article is compiled out of material from The Myth of Saint Thomas and the Mylapore Shive Temple and was posted on Acta Indica in 2010. This entry was posted in india and tagged christianity in india, encyclopedia britannica, indianetzone, st. thomas apostle, wikipedia. Bookmark the permalink.